Echoes of Mozart, Brahms, Bartok and Shostakovich and a host of other ingredients impart an infectious zest, and distinctive flavor, to Paul Schoenfield’s music. He moves with what has been called “wizardly ease” from jazz to popular styles, from vaudeville and klezmer (an Eastern European Jewish music that features a quirky clarinet) to folk music and dances from different cultures. Sometimes in a single composition. The result is a rhythmic, melodic, often exuberant music that disarms—then captivates—audiences and is fun for classical musicians to play. Indeed, Schoenfield has received commissions, grants and awards from Chamber Music America, the National Endowment for the Arts, the Rockefeller Fund, the America Composers Forum and many other organizations; his compositions can be heard on Angel, Decca/London’s Argo label, Vanguard, innova, EMI, Koch, BMG and New World. Born in Detroit in 1947, Paul Schoenfield was composing music by the age of seven. He studied piano, which he had been playing since the age of six, with Julius Chajes, Ozan Marsh and Rudolf Serkin and toured the U.S., Europe and South America both as a soloist and with groups from Music from Marlboro and elsewhere. Among other things, Schoenfield recorded Bartok’s complete works for violin and piano with violinist Sergiu Luca. He holds a doctorate in music arts from the University of Arizona. From 1988 to 1993, while his wife was doing her medical residency at Mt. Sinai Medical Center in Cleveland, Schoenfield taught piano at the nearby University of Akron. Taken with the versatile fiddling of Cleveland Orchestra violinist Lev Polyakin, who regularly sat in with jazz musicians at a local establishment known as Nighttown after orchestra concerts, Schoenfield became an enthusiastic, and much beloved, participant in the city’s musical life. In 1994, the same year he was awarded the Cleveland Arts Prize, an evening of Schoenfield pieces was presented at Reinberger Chamber Hall by Polyakin and other members of the Cleveland Orchestra with the composer at the piano. A compact disc titled Cafe Music (after the infectious three-movement romp for violin, cello and piano that had become the talk of Cleveland music circles) sold briskly. 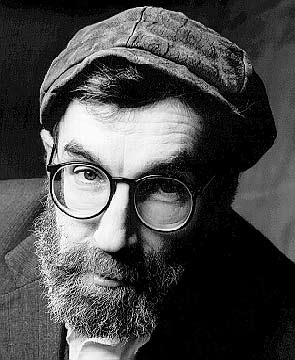 Donald Rosenberg dubbed it “irresistible.” It included a brand new composition, no doubt inspired by Cleveland's rich ethnic stew, called Slovakian Children’s Songs. Saxophonist John Sampen joined Schoenfield (piano) and Cleveland Orchestra stars Michael Sachs (trumpet), Thomas Sperl (bass) and Donald Miller (percussion) for Burlesque, an early piece based on a National Enquirer story about a stripper. And principal violist Robert Vernon, who joined Polyakin, cellist Nathaniel Rosen and the composer on Carolina Reveille, Schoenfield’s sly variations on the pop tune “Carolina in the Morning.” Vernon convinced orchestra management to let him give the world premiere performance of Schoenfield’s viola concerto in1998. The composer currently divides his time between Cleveland and Migdal HaEmeq, Israel.